Study history for any length of time, and patterns will emerge. One of the most curious patterns is how new forms of recreation are embraced, then inevitably sensationalized, stigmatized, and finally vindicated when cooler heads prevail. You see it over and over again in pop culture across the decades. Video games continue to suffer from periodic demonization, accused of instigating violence in children. Harry Potter books are still banned by some schools and communities for spreading occult ideas. 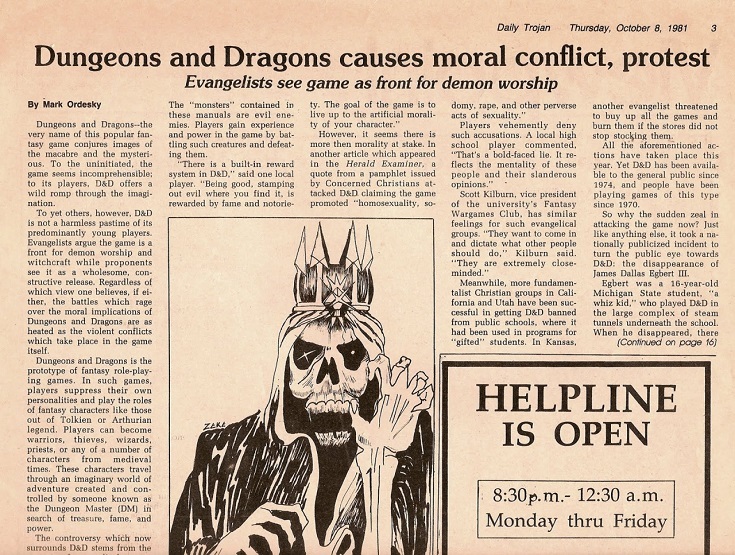 Not so long ago, one of my favorite pastimes — Dungeons & Dragons — was maligned as Satanic and damaging to young minds. All of these panics were (and are) patently ridiculous. After all, you can go back through history and find other examples that are absolutely ludicrous in retrospect. A whole family brought to destitution in England, has had all its misfortunes clearly traced by the authorities to an ungovernable passion for novel reading entertained by the wife and mother. The husband was sober and industrious, but his wife was indolent and addicted to reading everything procurable in the way of romance. This led her to utterly neglect her husband, herself and her eight children. One daughter in despair, fled the parental home, and threw herself into the haunts of vice. Another was found by the police chained by the legs to prevent her from following her sister’s example. The house exhibited the most offensive appearance of filth and indigence. In the midst of this pollution, privation and poverty, the cause of it sat reading the last ‘sensation work’ of the season, and refused to allow herself to be disturbed in her entertainment. And yet, it should come as no surprise to you, fellow puzzler, that crosswords also received this kind of treatment. Yes, crosswords were the focal point of a moral panic. 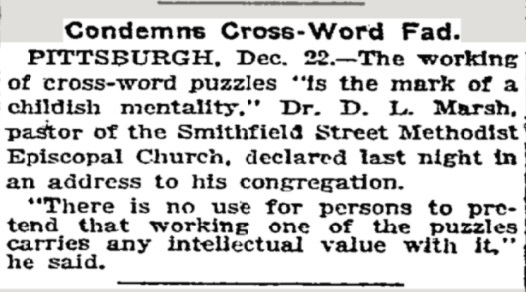 Arthur Wynne’s “word-cross” first appeared in The New York World in 1913. Simon & Schuster published The Cross-Word Puzzle Book, edited by Margaret Farrar, in 1924. 1924 also marked the first time a UK newspaper, The Sunday Express, would publish crosswords. By that point, crosswords were officially a fad, inspiring fashion trends (black and white patterns), hit songs, and musical revues on Broadway. Ah, 1924. It was a strange year for crosswords. 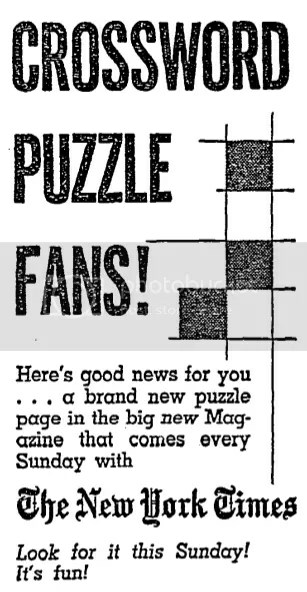 Because 1924 also saw some of the most inflammatory accusations hurled at the simple pencil-and-paper puzzles. It is obvious from the similarity of the cross-word puzzle to the child’s letter blocks that it is primarily the unconscious which is expressing itself in the cross-word puzzle obsession. That church reference was particularly notable, as there were church sermons decrying the negative influence of crosswords on society. Sermons! Imagine crosswords being treated like heavy metal in the ’80s. It’s mind-boggling. Theodore Koerner of Brooklyn asked his wife for help in solving a crossword. She begged off, claiming exhaustion. Koerner shot her (superficially) and then shot himself (fatally). Scarcely recovered from the form of temporary madness that made so many people pay enormous prices for mahjongg sets, about the same persons now are committing the same sinful waste in the utterly futile finding of words the letters of which will fit into a prearranged pattern, more or less complex. The paper went on to call crosswords “a primitive form of mental exercise” and compare their value to that of so-called brain teasers that should be solved by schoolchildren in 30 seconds or less. 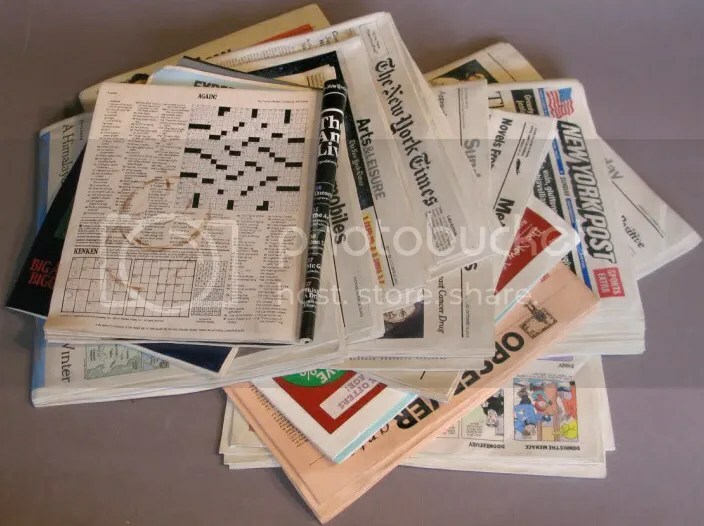 Crosswords wouldn’t debut in the New York Times until 1942. But could there have been a hint of truth buried beneath all the sensationalism? Perhaps. Those darn crossword addicts, always getting into trouble. Can’t trust ’em. So, the next time someone tells you crosswords are boring and passe, you can tell them that crosswords were as cool and as dangerous as rock n’ roll, once upon a time.